Jockey Robbie McNamara says he is feeling "optimistic" about his recovery after spinal surgery on serious injuries sustained in a fall. 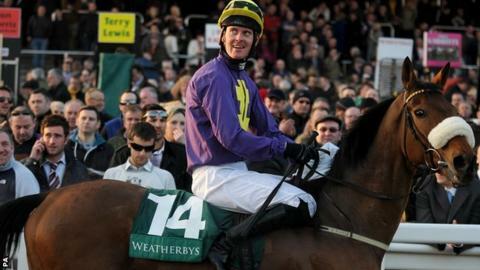 McNamara, 26, fell at Wexford on 10 April and his injuries ruled him out of riding in the Grand National. He is in the Mater Hospital in Dublin and despite having no feeling in his legs, he was able to leave his bed for the first time on Tuesday. McNamara tweeted: "Delighted to get out of the bed for the first time today. What a beautiful day for it to land on #littlevictories"
"I'm feeling great and I'm still optimistic," said the Irishman. McNamara, cousin of JT McNamara who was left paralysed after a fall at the 2013 Cheltenham Festival, tweeted a picture of his recovery. "I've no feeling in my legs at the minute, but it's early days," Robbie McNamara said, speaking on the Final Furlong Podcast. "My back is badly battered and bruised and there's a lot of swelling. I'd be hoping when all that swelling and bruising goes down, some of the nerve damage might repair and some feeling might come back." McNamara was partnering 14-1 shot Bursledon at Wexford when he fell four jumps from the finish in the Cahore Point Handicap Hurdle. He was due to ride 50-1 shot Lord Windermere at the Grand National - but was replaced by Brian O'Connell, although the horse did not finish the race.